This entry was posted in Christian Values, Culture, Fire Crime, France, Religion, Uncategorized. Bookmark the permalink. 829 Responses to Notre Dame Central Cathedral is Lost…. Under construction. Probable source. But…. It’s immensely frustrating that the context of church arson in France isn’t mentioned at all. It was just last month that this happened – police confirmed it was intentional. Not once mentioned on a single media network. Officials in all those church fires refused to comment on any possible causes…..
Of course it is allahu akbar arson. There is a slightly downsized replica Notre Dame Cathedral in Saigon which has stood for more than a century. Be assured the Vietnamese will not permit the muzzies to attack anybody or anything. Moslems in all of ASEAN have done their inbred wacko evil, but, not in Vietnam. 2,000,000 cult members worldwide. FGMed brood mares reproduce like rabbits and all are conscripted into the bizarre cult under penalty of death. Tlaib has 9 kids. Just what America needs, more jihadies. The usual suspects will let art, history, and religion burn rather than connnect such dots. Dying for PC priorities — with others in the line of fire as well — is the new (gutless) thing. Nine churches have been vandalised in 11 days during a recent spate of church desecrations in France. The desecrations have included the scattering of Eucharistic hosts and using faeces to draw a crucifix on a wall. Hoosier – I am shocked – shocked I tell ya!!! Easter Week. I have a healthy amount of suspicion. Probably a lot more than healthy. helicopters could have dipped from the river a couple hundred yards away and put it out. Looks like they didn’t have a fire emergency plan in place……….or did they? There was a fire exercise just days before. It’s considered too dangerous because of the bridges. Macron says using water creates smoke and ash which is “bad for the environment”. Photo of a French police drone from above. The fire is much worse than it looked from the ground. Call me naive or uninformed but I thought that the fire had been burning at ground level. It appears that maybe the under-structure and halls below could be saved if they can get it put out? At any rate this is a horrifying, terrible cultural loss for all of Western Civilization. My heart hurts for all Catholics everywhere and especially Parisians. The roof collapsed into the building the the outer stone walls of the building is all that is left from the sight of that photo. Its a really bad fire. The heat of such fires can compromise and destroy masonry and stonework. It may well be truly a complete loss. Sadly I think you are right. Maquis – the documentary I watched said the masonry was already in a state of decomposition due to erosion, age, etc. They are lucky the whole thing didn’t collapse. In that photo, the fire doesn’t appear to be burning at ground level. It appears that while the roof is gone, it’s burning in the attic space above the stone ceilings. I suspect that is not the case now, but best case scenario, the attic and the roof burn away rapidly like matchsticks, and the masonry remains. At 800 C about 85 percent of the strength of limestone is destroyed at elements within limestone vaporise. I fear a total loss from that night time photo. It is not unreasonable to question Islamist liability with recent church burnings and the very recent conviction of a Muslim woman who threatened a firebomb at the cathedral. IF the fire did start in the attic, in a ‘deserted’ cathedral, this is EXACTLY like the church arson described in Ken Follets book “Pillars of the Earth”, hauntingly familiar. Heartbreaking and, given the recent history of church vandalism, and threats against Notre Dame, the Catholic Church leadership, and the Pope were woefully derelict, security wise. Hence, if this WAS arson, they and the government will have strong motivations to discount it. More likely, they will blame it on the yellow vesters. Dutchman, Like in the book, here someone wanted to create some architectural work for themselves at the expense of destroying something already beautiful. /Sarc off. I thought that was a great book. Another tragedy is that the world no longer produces men with the knowledge, skills and abilities to build masterpieces like the Notre Dame Cathedral today. Notre Dame Cathedral was lost today, but the skills that took to build it were lost many years ago. Beg to disagree. With Ken Follets book, “Pillars of the Earth” as a starting point, along with some technical books on church architecture, I could rebuild it, and i’m nothing special! There ARE people alive today who could rebuild it, just cost a LOT of money. Probably will be replaced with an Islamic Cultural Center, though as a way to apologise to the muslims, for existing. grief stricken. If this was done by a person then may God grant him the grace of conversion and peace from all his wrongdoing. Lord have mercy. St. Louis pray for us. St. Genevieve, pray for us. St. Joan of Arc, Cure of Ars, St. Thomas, St. Dominic, all the saints of France, pray for us. May we forgive. May the hearts of France be healed. Mother of God pray for the hearts of France. Amen. Now pass the ammunition. people are complicated, i.e., I am laughing. Above all other Saints, St. Dennis, Patron of France. I apologize in advance if I failed to use correct nomenclature as I am not Catholic, but am far from anti-Catholic. The very fact that the question is asked, “Was this an act of IslamicTerrorism?” should send a very clear message to the naive. This possibility is included when the group in question does these kinds of horrible acts regularly. I am not a Catholic but the loss of all this beauty and history just moves me to tears. And Muslims pass out candy and praise allah. It’s really a tragedy that this magnificent building withstood wars only to be burnt down in 2019. With such a historic building, I was shocked that the fire brigade didn’t have a specific plan for it in the event of fire. Particularly because so much of it was composed of wood. I really hope there is added security for the other cathedral in Rheims. Thank you for that thread! That was an informative read. The most beautiful after Sainte Chappelle is Notre Dame de Chartres. The glass program at Chartres is 2d to none. The locals took out everyvpiece of stained glass and hid it all over the countryside during WW2 so that if the Germans blew the cathedral, the glass would survive. Chartres should be surrounded with armed Catholics. There are so many European cathedrals to protect; not just in France. To my Catholic friends here in the Treehouse. I weep with all of you tonight. My French students over the years – I will never forget their faces of utter amazement each time we visited Notre Dame de Paris, Chartres, and so many other extraordinary architectural masterpieces of Christian and western civilization. I can barely watch the live webcam, but I can’t look away either. I listened to Macron’s remarks, and while he is not well regarded politically in this household, tonight’s address, on site, was eloquent, and a call to arms to begin rebuilding immediately – as soon as the smoke clears. Saving the suspicions to deal with tomorrow. Tonight we grieve the horrifying loss of la Cathédrale de Notre Dame de Paris, en pleines larmes, et sans paroles. Like most other historic cathedrals, many of which have also had major fires—it WILL be rebuilt–if the PC culture in France do not prohibit it—who thinks it was construction-related? Or…….? And who can trust that process given what they’re blaming on the current “renovation”? It’s tough not to assume terrorism … and to also assume there will be very strong political incentive to cover it up. My wife just reminded me of an ISIS attack at Notre Dame in 2016 when she was in Paris with her sister …. Charles Martell (he trounced the Muslims at the Battle of Tours) is buried here as well as the French kings. Finally – Notre Dame was not only a Catholic symbol it was a symbol of Christianity. There is video of muslims in front of the burning cathedral screaming allahu akbar. I cannot bring myself to watch it, but it is out there. I saw that too but there is another version of it without the allahu akbar. Repay no one evil for evil. Have[a] regard for good things in the sight of all men. If it is possible, as much as depends on you, live peaceably with all men. Beloved, do not avenge yourselves, but rather give place to wrath; for it is written, “Vengeance is Mine, I will repay,” says the Lord. Oh my gosh, this makes my heart sick. I hope this was not a terrorist event but this being Holy Week triggers my spidy senses. It was said it happened at rush hour and there were delayed getting fire teams on the ground. Time they didn’t have. The question is, what if it was a high-rise building you were in? Does rush hour create a problem? “It has survived so much—from the French Revolution to Nazi occupation—to watch its devastation is excruciating." Muslims, doing the job the nazis wouldn’t do. Carson Napier……how true that statement is. Yes, yes Carson Napier. 1,400 years of inbred evil. 2,000,000 of them. They are everywhere including the United States Congress. They are a significant part of the evil invasion of our southern border. They are the subhuman, genetically mutated Morlocks and we are the Eloi. Heaven help us. A poster on Zero Hedge who has an acquaintance in France who casts church bells says his French friend states the fire is now contained. So, it started in the attic? Ya, I am not buying the “whoopsie” theory. Such a loss for the world. France has abandoned its Catholic faith for the most part so perhaps God took away His cathederal. Honestly, I think you can find some French who are still quite faithful to the Catholic faith. They are few in numbers, but they are there (praise God). I immediately thought this fire might be terrorism. We will have to wait to see if anyone claims responsibility. The French people need to wake up. Are the rose windows destroyed? I have heard no mention of them. By 9.30pm there were claims from fire fighters around the cathedral that the priceless stained glass Rose windows in the Cathedral had been destroyed. ‘They exploded because of the heat of the blaze,’ said one, referring to the Rosette West, which was created in 1225, the Rosette North (1250) and the Rossette South (1250). So sorry to hear this…….. It was reported that they are destroyed… the lead melted. Bocephusrex, I believe that was not Notre Dame in that pic with Pompiers on the roof. It was an example of a “roof trench” cut through to allow access to a fire. He said Notre Dame was too steep to stand on. Also, Notre Dame had a blackish roof, slate, I believe, the example pic is brown, quite uniform, likely a composition roof. Other than that confusion, it was a great thread, very informative, thanks for posting it. This has been a month where scores of attacks on churches in France have occurred, a woman was sentenced for trying to destroy what now is in ruins — one of the most visited landmarks in Europe, and general unrest has gripped Paris, which some might see as now the land of the no-go zones and the city of lights only by merit of the burning vehicles and buildings for which criminals relatively new to the region have often been the culprit. Now, this building which represented to many from a particular worldview a symbol of Christendom which was built and stood through countless wars, weather challenges and the like has been decimated. Not the Louvre, not the Eiffel Tower, but a symbol of Christendom. You’ll have to pardon me if I i unapologetically refuse to default to workplace oopsie when considering how this happened. Did you hear the Cardinal outside of St Patrick’s Cathedral commenting on this tragedy? He said that places of worship are where people bring their happy faces and their sad faces, and this is a sad face. Talk about an understatement! Is he kidding me? I am sorry to say that the Catholic Church has gone full on Marxist. The Cardinal reminded me of Big Ears Bush, doubling down on his storybook with that stupid look on his face, as he was informed that the Twin Towers and Pentagon were burning. They may as well stick their fingers in their ears and yell LALALALALALALA! It makes sense to me. Erase the past to usher in the Islamic France. As a Catholic way out here in Oklahoma, this feels like a kick to the gut. All the wind has been taken out of my spirit today. I am praying for my Christian brothers all across Europe tonight. I agree. I think it is a universal jolt and day of sadness for Catholics worldwide. Howdy neighbor… I’m a Catholic here in Ft Smith, AR on the border. My prayers are with our brothers and sisters in France, they’ve been robbed of a huge part of their heritage! The lost artwork, religious artifacts, stained glass, sculpture, and other treasures so important to the catholic faith………………. If true the firemen are international heroes. I pray it is true. I heard they were moved out prior to construction. Yes, they were moved prior to the renovation, as well as most of the statuary on the outside of the building. Good news. Looks like the main structure will not be a total loss, per Paris fire spokesman. Still a catastrophic loss. To put 850 years in perspective, the collapsed portions survived two world wars (three, if we take the Napoleonic Wars into consideration), a siege during Franco-Prussian War, the French Revolution, the various religious wars of the 16th and 17th centuries, and the Hundred Years War. Judging by the 2nd picture, it seems much of the wooden furniture survived at ground level. That’s fantastic news regarding everything else at ground level. I did read that firemen were able to save almost all of the artwork and relics inside… small consolation compared to a true monument of the Christian faith being lost. Ironically perhaps, today a Muslim woman was sentenced to 8 years in prison for trying to burn Notre Dame down. Could this be retaliation? With churches across Europe under attack by the Muslim invaders, I would be shocked if they weren’t responsible… I would be equally if not more shocked to have officials tell the truth about the cause. Dozens of churches attacked this year. Don’t hear much about it. We’re the bad guys, we Christian folk./sarcasm. Apparently, the media thinks we’re stupid too. Boy, WP is a real challenge. This great loss may alter the course of history, for it will arouse powerful feelings which may affect the outcome of the Yellow Vest movement, and that in turn will affect the fate of the EU. Wasn’t Macron going to make a statement about the yellow vests today? I read he canceled his planned announcement. He moved it to tomorrow. Which is why we’ll never know the truth. NEVER. If the walls stay standing, then they ought to be able to rebuild it with a steel frame. Those flying buttresses are pretty strong. I believe Notre Dame is the best example of that construction. I’m not quite sure that the roof was even needed to keep the walls up. It surely provided some downforce and kept the ceiling up but the walls? Medieval buildings with wooden roofs burned all the time. Sure it’s a tragedy but look at the bright side, no one died, no one was injured and we will rebuild it. Better and stronger. My job, before I retired, was restoration work on historic buildings. Very hard, here in the USA anyway, to accidently start a fire on one of these sites. On the other hand we were always chasing people off the sites, particularly in the mornings. Le Figaro: “Incendie de Notre-Dame de Paris: la structure est sauvée”. The structure is saved. The North towers had firemen on the roof checking for fires. The North towers have survived for sure. I hope The Louvre is better prepared. This is tragic. Hmmmm, maybe “some people did something”? I’m sure it’s just a coincidence because no one could ever have an intentional “accident” and I’m sure security was absolutely top-notch on the construction site. BTW, how many times was it renovated before France’s current immigrant problems? It will be interesting to hear the true cause although if it was intentional I don’t think we’ll ever hear it. I don’t think we will be told if it was an act of terrorism. They already are saying that arson will not be considered. I hate jumping to conclusions but since they are why shouldn’t we at leat be skeptical. Makes me sick. According to France24 arson will not be considered during the investigation. So we rule it out even before we investigate. Why am I not surprised? As they say in France . ALLAHU AKBAR . And, as we say in the U.S.
“Just WHO the He!! is “allie”, and WHY do I care they have a SNACKBAR? I find this comment offensive. Yes the muslims in France rejoice. Not a French person does. I am not catholic and I am an expat but it hurts just the same. Today I feel horror the way I felt it when I saw the first airplane hit the trade center in 9/11. Of course I do not compare the 2. On 9/11 so many lives were lost, so many families were affected. It’s not comparable except for the initial shock. I mourn for my former country, and for all catholics in the world. The cathedral was not simply inspiring and important to Catholics, but to Western Civilization and to all of Christianity. The video of the spire toppling over in flames was just too reminiscent of 2001 for me. The only thing missing was people jumping to their death. George – same here. It has been a shocking day, for sure. I remember falling to my knees in grief watching the twin towers come down. I felt much the same today. Very sad. I’m Catholic and one of the landmark structures of the church ‘just happening’ to burn to the ground at the beginning of THE most sacred week of the year for our faith, well….I can’t help but put the tin-foil hat on. Yes, I understand architectural authorities and others have been warning for YEARS of the inherent defects of a predominantly WOODEN structure but…come on. It sounds materialistic to mourn the loss of something physical but this is devastating. 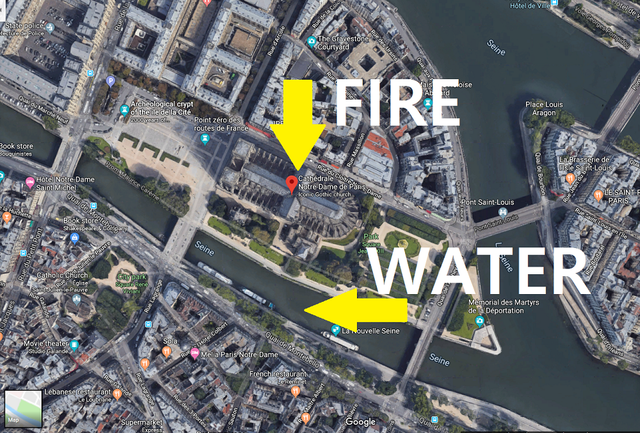 Doesn’t this water source seem, I don’t know, IN CLOSE PROXIMITY to Notre Dame? And Trump – as usual – is completely castigated for stating the obvious (airborne tankers being used). On a firefighter post explaining how they fight fires, one reply claimed it took 2 hours to get water on the fire?! If the fire started in the attic as reported, it would have been extremely difficult to get water *directly* on the fire until the fire had reached the exterior of the building. That may have taken some time. Thick roofing and all that wonderful scaffolding would have blocked a direct attack from the exterior, and the interior was not designed with modern firefighting access in mind. It likely took some time to figure how to get hosing in range and then deploy the personnel. By then it was probably too late. Structure fire often take less than minutes to create fatal flash over conditions. By the time a plan could be drawn up and implemented, it was probably too late to get up to the attic area. The structure was also under renovation. We do not know if there was a concern about explosive or combustible fuels (paint, paint thinner, staining, etc) which further complicated a response or how the renovations may have blocked access to certain areas. The larger questions are 1) what, if they did exist, were the fire prevention measures and fire response plans and 2) how, and why, did they prove inadequate? It likely took some time to figure how to get hosing in range and then deploy the personnel. If the Parisian Fire Dept. didn’t already have a plan in place to attack a fire at the Cathedral then they would be completely irresponsible. Every City/Town FD has a plan in place to combat possible situations at the structures in their community, especially the ones that would be more difficult than ‘standard structures’. I lived in the highest apartment building in my community and the fire dept. practiced on our building annually. The Renovation Contractor would be required to file a ‘Site Specific Safety Plan’ which would be reviewed with the fire dept. and would address the storage location of any combustibles, as well as any changes to egress. Plus, the fire dept. would make visits to the construction site on a regular basis to ensure the filed plan was being followed. The fire started due to renovations is just too easy and too convenient of an excuse at such an early time. The proof will be in the pudding…do they rebuild it??? Their hoses did not reach the top of the structure. Looking at all the pictures of the ladder trucks spraying water on the fire, you can see they don’t have the altitude needed to douse the flames. Many news outlets are trying to make Trump look foolish by suggesting an aerial water attack, but if you view the photos and videos, it’s pretty apparent that, that was what is needed, despite the lack of resources. I hope this proves true. Another wake-up call to be met with weepy candlelight vigils. More to come, but you only get so many chances to wake up. weepy candlelight vigils where stupid idiots take selfies of themselves crying in order to virtue signal how fabulous they are. I’m so sick of them all…. “weepy candlelight vigils where stupid idiots take selfies of themselves crying in order to virtue signal how fabulous they are. So far it looks like an accident. It was under restoration work. Yet, no construction workers were on site, from a tweet quoting a French authority. Good news: all the works of art were saved. The treasure of the Cathedral is intact, the Crown of thorns, the Holy sacraments. As if we could avoid their inevitable vile commentary. Macron looked like a little boy who wandered to the microphone. Yup. He never seems to have real emotions, always portrayal. If the fire was caused by alleged “renovation carelessness” it is one of the worst examples ever of incompetence and irresponsibility. 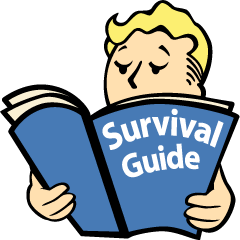 Any reasonably competent Reno crew are fully aware that working on old buildings, let alone ancient wooden structures like Notre Dame, requires extreme planning and maximum precautions. This is a sad day for everyone that marveled at the structure of “Our Lady” (the blessed Virgin Mary) when we (whether Protestants and Catholic and others) were in Paris. The nighttime Seine River cruises will never be the same again. Unfortunately, terrorism in France is a reasonable suspect because eliminating all Christian structures in Europe is what a few radical groups of newly invited people to Europe yearn for. No 24 / 7 security? Security cameras? What’s next, the Eiffel Tower? Opps, I think France is already protecting it with fancy, permanent barricades. Why would they have those? It’s not as if terror and attacks on church buildings including plots on this specific one ever happen. Yeah, put a ring around the Eiffel Tower and completely ignore the invasion at the border. Construction by a muzzle-em construction company, perhaps? ILHAN OMAR will blame POTUS for the catastrophic fire at Notre Dame. But that will also depend on how soon the “ISIS claims responsibility / radical Muslim group claims responsibility” tweets start showing up. I hope it is not, “some of those people” that did something. You know if Muslims had experienced a similar situation, it would be OBLIGATORY, in order to show “we’re NOT ‘Islamaphobes’,” that all non-muslim leaders would be tripping each other, trying to get to the microphone. Omar BETTER keep her mouth shut on this one, seriously. Would we rather that Omar hang a painting in her dining room to commemorate the occasion, like Amanpour did after 9/11? “Some people did something.” Indeed. Amanpour is Christian. Yeah, I don’t like her either, but consider her first name.She is not Muslim. You are correct. There was an article featuring Amanpour favorite picture of the crumbling towers. he doesn’t deny it. She flaunts it. nothing to see here…move along…Easter??? Timing of the fire makes it incredibly suspect.